Jacques was born in 1910 in France. He was a feeble child, but life’s twists and turns built him up and made him curious. Even as a child, he had questions about water –always water. He loved the way it felt encompassing and lifting his body and his interest was never diminished as he grew older. After seeing a man breathe underwater with a tube, he began to have dreams at night in which he was flying in the clouds using his arms like wings. Jacques liked to experiment, play games and write little books that he illustrated with his own drawings. He was also fascinated by machines and built a model of a crane that actually worked. He learned to read blueprints at an early age. At age 13, he built a car that ran on batteries. Despite these leanings, the teachers at school seemed uninterested. Next was a pursuit in movies. He saved his allowance penny by penny and bought a small home movie camera. What did he do with it? He took it apart and put it back together. Soon after, he filmed everything around him. He even created his own films in which he played a villainous character complete with a painted mustache and cape. He played all the parts in his home movies: actor, director, cameraman. He filmed his parents walking the plank. In summer camp in the United States one year, Jacques and his brother Pierre were at Harvey’s Lake in Vermont. A counselor gave Jacques what he thought was a demanding job: daily dives to remove limbs from the bottom of the lake. He loved it. In public school, he was a bored troublemaker. He created havoc and seemed not to care. In desperation, his parents sent the teen-aged Jacques to a strict boarding school, and to their surprise, he loved it. He studied hard, really made an effort and became an exemplary student. Following his education, Jacques went to the Naval Academy at 30 and joined the navy at 33, which allowed him to sail all over the world. From 1932-1933 he sailed around the world on a training ship called the Jeanne D’Arc. At first, he thought he might be a pilot, but both of his arms were badly broken in a sports car accident. In fact, the doctors had talked about amputating his right arm as it was infected. He insisted he would overcome it. They told him to swim for strength, and he did. His injuries took almost a year to mend and fate had intervened in a strange way to his benefit; his classmates at the naval school, all accomplished pilots, were sent off to war during his recovery and all but one was killed. While swimming for health to strengthen his arm, Jacques and his friend Philippe Taillez met a free spirit named Frédéric Dumas, who was a kind of beach bum and would become known to them as Didi. During his travels in the French Navy, Jacques had been fascinated by the fishermen in China he saw who held their breath and came up with fish in their hands. He wondered what that felt like. Didi answered his question by teaching them how to catch fish with their hands and how to cook them over a fire fueled with seaweed. One afternoon, someone (we know not who) gave Jacques a pair of swim goggles to try out while fishing. Those goggles changed his life. Swimming and diving were wonderful, but beneath the sea was a whole new world of magical things to see. His goggles became his invitation to look into the shimmery waters. Diving became his passion. He knew his life would be different now that he knew the ocean in a closer way. He felt alive at what he saw underwater and deep diving became an all-consuming desire. A trip in 1936 took him to Paris. While there, he met Simone Melchior, a beautiful girl who had come from a long line of navy admirals. They married. His in-laws thought that his navy career made him “promising." Simone often dived with Jacques during their new married life in Sanary, but stopped midway through her first pregnancy. Then the joy of Jacque’s and Simone’s new son, Jean-Michel—and Jacques’s undersea adventures into diving and creating equipment—was temporarily interrupted by World War II in 1939. He fought the Germans as a gunnery officer in the French Navy. It is also said that Jacques became a member of the French resistance movement as a spy. Dressed incognito as an enemy soldier, he took pictures of much-needed secret war documents and later, received medals for his efforts. Alas, Toulon fell to the Nazis. When France capitulated to Hitler, the fleet Jacques was on disarmed. Soon after, his second son, Phillipe arrived. Jacques and his friend Phillipe hoped they would be picked to help remove mines from the war assault of ammunition that fell into the waters, but the limitations of the current breathing devices put the kibosh on that. Soon enough, things settled after war’s end and his friends Phillipe and Didi began to dive with Jacques again. Reunited, the challenge of course was to see how long they could stay underwater and then how deep each could go. In his spare time, Jacques worked on creating a waterproof case for his camera. They all helped to make rubber suits to stay warm, using flippers to kick better and to stay down longer. Jacques wanted more time to study the underwater world and he knew he needed to build something to help him achieve that goal. His father-in-law, Melchior, was an exec at Air Liquide, a company that manufactured gases such as oxygen, nitrogen and carbon dioxide. Jacques and Emile Gagnan, an employee from Air Liquide, worked long and hard and eventually invented the AquaLung. The tank allowed a diver to breathe underwater but was complicated, in that the air pressure in the water had to be delivered at an exact pressure to the tank and the levels of carbon dioxide needed to be regulated to live. The system developed was cumbersome at first, but it worked. The next problem with deep diving was how to avoid getting “the bends." First, there was a disorienting rapture when divers became dangerously deep that manifested itself as a lethargic feeling (it’s called nitrogen narcosis). In addition, you can be injured if your body isn’t able to adjust to the increasing and decreasing pressure of the water as you breathe compressed air (that is barotrauma). A too-swift return from the sea to water’s surface could be fatal (decompression sickness). Jacques approached the British about using the Aqua-Lung for war purposes but they dismissed the plan as “too late." The Brits renamed his breathing apparatus however: Self-Contained Underwater Breathing Apparatus or SCUBA. Jacques and his newly designed Undersea Research Group often used it to get rid of enemy mines left after the war. In addition, the underwater camera Jacques invented became a much better, more useful model. Eventually, the new sleeker version of the Aqua-Lung allowed him to do somersaults, glide through water in any direction and laugh bubbles into the sea. He could breathe underwater and become one with the fish. With his camera, he could share his remarkable undersea travels. Jacques became mesmerized by his underwater world and figured out he needed a boat, because he was going to visit the oceans all around the world. An old, wooden navy ship became available. It had been used as a minesweeper and a car ferry. In one year, Jacques renovated it from a war/work ship to an explorer’s lab ship named Calypso. Africa, the Atlantic, the Indian Ocean—the tight-knit crew examined fairylands of fish and even made friends with a giant grouper they named JoJo. They visited such diverse locations as South America, Mississippi, Hairi—literally all over the world wherever there was an ocean, river and an underwater world of fish, mammals, plant life and coral reefs. Jacques Cousteau’s “The Silent World" was the first full-length, full-color underwater film ever made. The book version of The Silent World brought Jacques Cousteau international attention. By the end of 1953, The Silent World had sold nearly 500,000 copies. Jacques went to the Red Sea and filmed the coral reefs and the bump fish that crunch them. One find was a sunken ship full of wine jars off the coast of France. It had been there 2,000 years. He recorded prickly plants, swaying plants, plants that catch fish held sway. They discovered camouflaged fish, blow-up fish, fish that glowed. The crew swam with turtles, dolphins and giant whales. He filmed sharks and built cages so they could observe them without being eaten. His films of the sea started showing up in movie theaters and then on TV. Cousteau said, “The best way to observe a fish is to become a fish." The team invented a diving saucer, which could go 350 meters deep. Then the team invented the Sea Flea, which could go even further (500 meters deep). They also built underwater labs, but people just cannot live underwater for long periods. The first underwater home was called Conshelf I. Resembling a barrel, it had all the comforts of home, but a week inside was enough. Conshelf spawned later versions, Conshelf II and Conshelf III. They learned a lot by living and working undersea. 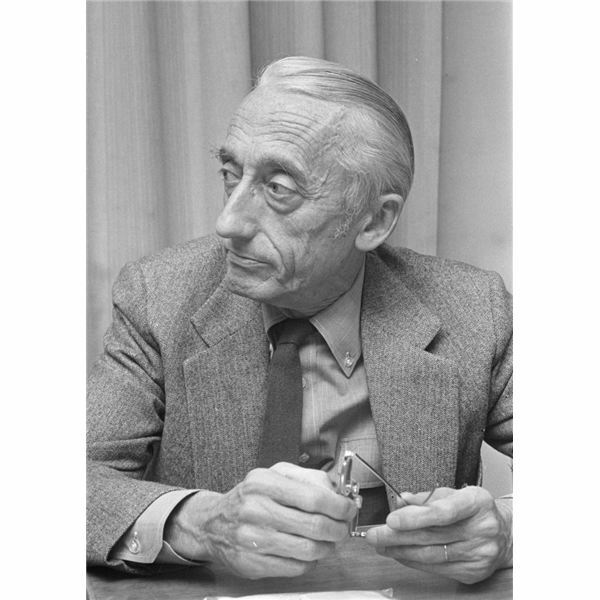 Cousteau became an ocean ambassador. He ran into his share of troubles, another war, a typhoon and needing a budget for more adventures. In 1957, Cousteau left the navy after 27-years and became the new head of the Oceanographic Institute, appointed by Prince Rainier of Monaco. The TV series “The Undersea World of Jacques Cousteau" would change his life again. Upon signing a $4.2 million dollar contract, the series would run for four years, with three shows a year. After filming underwater wonders most of his life, the places he revisited scared him. It was an epiphany. Plants were being poisoned. Fish were sick and dying. Garbage and dangerous chemicals were being dumped willy-nilly into the ocean. He knew he had to do something about it. Jacques spoke to presidents, kings and queens and people all over the world. In 1974, the Jacques Cousteau Society was created to educate people about the seas and protect the environment. Within a year, the Cousteau Society had 120,000 members. Unfortunately, Philippe, his son, who worked as a leader in the Cousteau Society died in a helicopter crash. His son Jean-Michel often worked with him after that. In 1985, President Reagan gave him the Medal of Freedom and in ’89, he earned membership into the French Academy. Cousteau, Jacques-Yves and Philippe Diole. 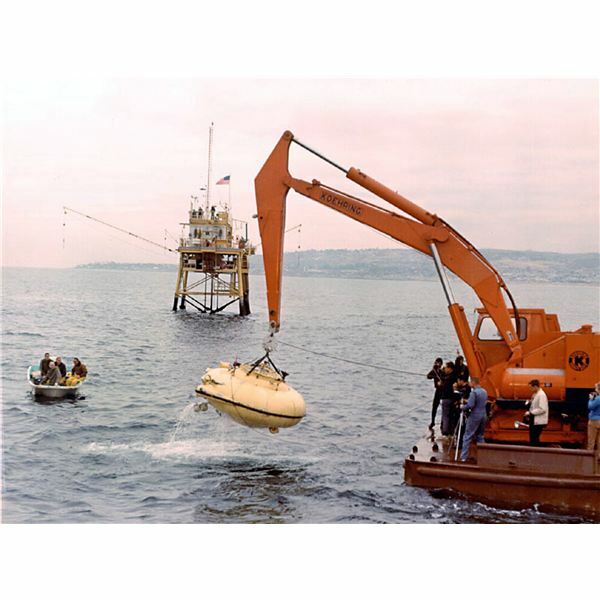 The Undersea Discoveries of Jacques-Yves Cousteau: Dolphins. Garden City, New York: Doubleday & Company, Inc., 1975. Book. Sinnott, Susan. The World’s Great Explorers: Jacques-Yves Cousteau. Chicago: Children’s Press, 1992. Book. Yaccarino, Dan. The Fantastic Undersea Life of Jacques Cousteau. dreamscape, 2014. DVD. Green, Carol. Jacques Cousteau: Man of the Oceans. Chicago: Children’s Press, 1990. Book.